Records Records Records records' second release is a book. 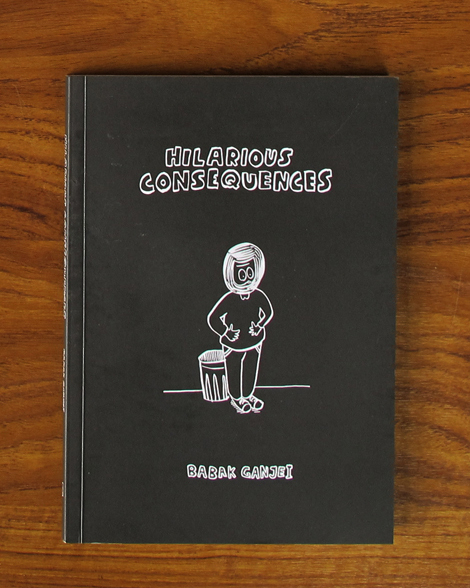 Proudly brought to you by our publishing division, Records Records Records books, this graphic novel comes complete with a CD - Hilarious Consequences: The Soundtrack. Babak Ganjei's many years as guitarist in Absentee and frontman of Wet Paint have helped inform a story about struggling to juggle creative pursuits whilst attempting to grow up, be a father and not a rubbish boyfriend. Michaelson and the Coastguards, Cheatahs, Big Deal, Wet Paint, and Matthew C H Tong. This does live up to its title. A discovery for me, this one, a really funny, self-deprecating set of 34 sketchy sketches, six panels per page, 3x2, about the stresses and everyday anxieties of Babak Ganjei. He is a broke, balding, hyperchondriac husband and father who wants to be responsible but is still signing on and holding out for the dream of making it with his music and record label, and perhaps with his comics too. Ganjei worries that he will let his little boy down as ‘an idiot parent’, so he’s prepared to make some sacrifices, like working late shifts in a disspiriting bar. Don’t be fooled by the ‘simple’ loose cartooning here, Ganjei knows how to pace his tales and deliver gags and touches of pathos too. These episodes gradually build up to a gig that goes absurdly awry and yet it ends with some modest measure of happiness. Inevitable comparisons will be made with Jeffrey Brown’s autobio confessionals, but Ganjei is doing this his way, even ending with a wry epilogue about the Brown connection. The interludes with the ‘glitter slugs’ add a ‘Lynchian’ quirk as well. The book 104-page paperback comes with a CD ‘original motion picture’ soundtrack by various acts including Ganjei’s band Wet Paint.